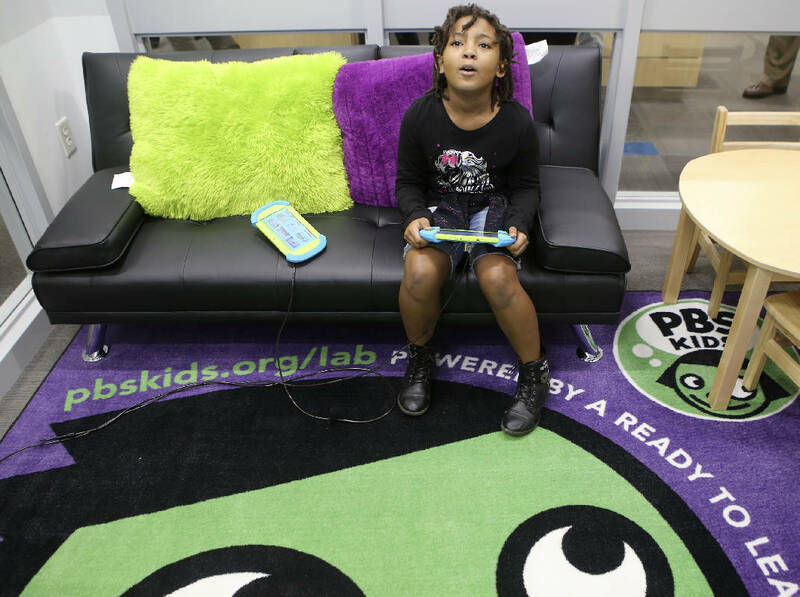 Nine-year-old Mikayla Sanders looks up at the television while checking out the PBS KIDS Learning Lounge at the Family Justice Center on Thursday, Nov. 9, 2017 in Chattanooga, Tenn. The Learning Lounge offers a fun area for children to use while in a waiting room. Nine-year-old Mikayla Sanders pumped her fist and cheered as District 6 Councilwoman Carol Berz cut the ribbon allowing entrance into the city's newest Learning Lounge at the Family Justice Center recently. "I love this," said the home-schooled fourth-grader before plopping into a black couch decked out with yellow and purple pillows. The Learning Lounge is the result of a partnership between the city of Chattanooga, First Tennessee Bank and WTCI-TV. The goal is to educate children while they wait as their parents seek city and state services. Depending on the study, some 40 percent to 60 percent of kids arrive at kindergarten not prepared, said Jennifer Crutchfield, WTCI's director of communication and community engagement. To address the problem, WTCI and city officials created a hit list of places where kids sit in waiting areas with their families. Those will be the places targeted for Learning Lounges, she said. And PBS' programming isn't limited to preschoolers. Its online learning media include programs for youth from prekindergarten to sixth grade, said Crutchfield. She calls WTCI "America's largest classroom" and said that students who watch "Super Why!" and other PBS KIDS programming score an average of 54 percent higher on standardized tests. "Children grow when they are exposed to positive, engaging, learning media. These lounges allow us to engage our youth in education across the city," said Jason McKinney, deputy administrator for the city's Youth and Family Development department. Mikayla enjoyed the Family Justice Center's Learning Lounge so much, she said she'd like to visit every day. "It makes you think," she said while emptying a puzzle on the table. "There's not someone in here to tell you what to do and how to do it. It's just learning." As parents come to take care of business, they'll know their kids are in a safe place, said Richard Johnson, WTCI's vice president of development. The Family Justice Center location is the city's second learning center. The first opened this summer at the Human Services building on West 12th Street. The city plans to open two more lounges at Avondale and Cedar Hill Head Start buildings before the end of the year. Crutchfield said she also hopes the Learning Lounges put parents more at ease when applying for services or doing businesses at city facilities. It could feel very uncomfortable coming to apply for food stamps, said Crutchfield. Having the Learning Lounge creates an opportunity for family time with the child and parent, and the parent may be able to have a more effective meeting with case workers if they know they're children have a safe area to play, she said. First Tennessee Bank provided all the funding for the Family Justice Center Learning Lounge. The room is equipped with books, flat-screen TV tuned to PBS Kids, puzzles and oversize Tweety Bird and Winnie the Pooh plush toys. Contact Yolanda Putman at yputman@timesfreepress.com or 423-602-0574.